Director Woody Allen (center) with stars Cate Blanchett and Alec Baldwin. Woody Allen’s new film, Blue Jasmine, opens today at the Clay Theater on Fillmore Street. It’s set mostly in San Francisco, and some scenes were filmed locally in Pacific Heights. Blue Jasmine “seems to me the best film Woody Allen has ever made,” says film critic David Thomson, a neighborhood resident, writing in The New Republic. The 78-minute documentary debuts this month in San Francisco. JIM TRACY, longtime running coach at the neighborhood’s University High School, never set out to be a film star. But when life conspired to deliver a record-setting team, a diagnosis of Lou Gehrig’s Disease and a community that rallied around it all, he could be no other. 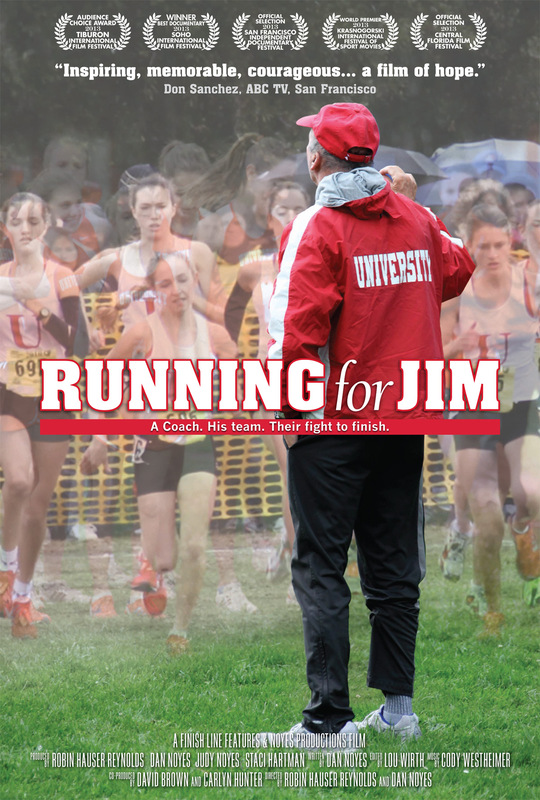 The result is Running for Jim, which screens this month at the San Francisco Independent Documentary Film Festival. The race was a nail-biter from the start. One of the team’s top runners, Jennie Callan, fell at the 100-yard mark and slipped to last place, then rallied to finish 16th in the roster of 169 runners. Other team members also ran their hearts out. Adrian Kerester, who had never run in a state final meet, placed 25th. Lizzie Teerlink beat her personal best time. Bridget Blum led for more than half the race, finishing third. But Holland Reynolds, the team’s fastest runner, slowed around the 2.5 mile mark, then hit the wall. Three yards from the finish line, dazed and dehydrated, she collapsed and fell to the ground. A race official hovered over her, explaining she either had to complete the race without help or withdraw. An agonizing 20 seconds of film shows Reynolds crawling over the finish line before being swept away to a waiting ambulance. Actress Minnie Driver will be present for opening night festivities January 17. Jack Bair — a co-founder and director of the Mostly British Film Festival, which opens at the restored Vogue Theatre at 3290 Sacramento Street on January 17 — leads two lives, at least. His day job is as senior vice president and general counsel of the San Francisco Giants, a team that had a good year. With the festival celebrating its fifth anniversary, Bair says this also promises to be a good year for the Mostly British Film Festival. Working for a baseball team, how did you also become involved in saving old theatres and presenting a film festival? I first became involved in an effort to save the old Cinema 21 Theatre on Chestnut Street. I saw the theatre boarded up as I was walking back from a softball game at Moscone Field. My reaction was immediate: I had to do something. Fortunately, the effort was successful and gave life to the San Francisco Neighborhood Theater Foundation. 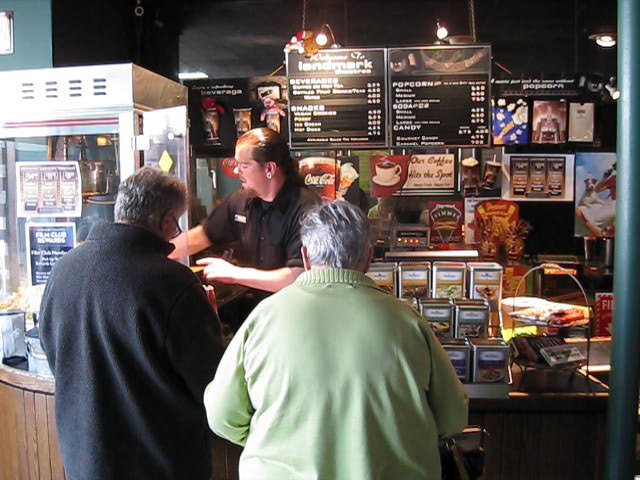 The old Cinema 21 has been reincarnated as the Marina Theatre and is alive and well. With the Bridge Theatre and Lumiere Theatre closing, there are very few neighborhood theatres left; the Clay on Fillmore is a surviving exception. We have approached the owners of the Bridge Theatre and made an offer to keep it open, so we hope there is still a chance to save it. Fortunately, there are still a few neighborhood theatres left. We own the historic Vogue Theatre on Sacramento Street. The Vogue just celebrated its 100th birthday and is one of the oldest movie theatres in the world. We also took over the lease at the Balboa Theatre to keep it alive. David Thomson’s The New Biographical Dictionary of Film is considered a must-have reference by almost all serious movie buffs. But Thomson is more than just a film critic, more even than a film historian. His works include a biography of novelist Laurence Sterne, an account of the Scott Antarctic expedition and a brooding meditation on the state of Nevada, along with a few novels and some autobiographical works. In his ambitious Have You Seen…? Thomson presents his take on 1,000 films, pointing out the wonderful ones like a favorite uncle showing you something shiny. Born in London in 1941, but a San Francisco resident for the last three decades, he still speaks with a soft English accent. 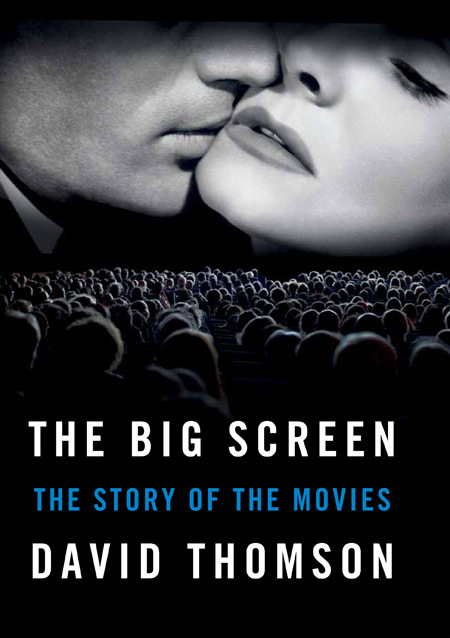 Farrar, Straus and Giroux has just published Thomson’s 23rd book, The Big Screen: The Story of the Movies — a good time to catch up on his ruminations about life, film and the future. 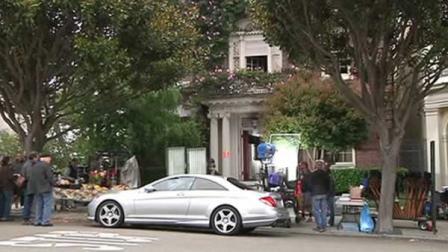 WOODY ALLEN started shooting his new film in the neighborhood yesterday along the Gold Coast homes on outer Broadway. The crew was filming next door to the Gettys at the Willenborg residence at 2898 Broadway, a location also used in other films. The as-yet-unnamed film is said to be a romantic comedy about a woman downsizing in San Francisco after her posh New York lifestyle comes crashing down. Allen will be filming in San Francisco and Marin County until the end of the month. The cast is rumored to include Cate Blanchett and Alec Baldwin. Film crew at the Swedenborgian Church, with Nicole Kidman in the doorway. Legendary filmmaker Philip Kaufman — director of The Right Stuff, The Unbearable Lightness of Being and many others — has lived in Pacific Heights for years. His latest film premieres on May 28 at 9 p.m. when HBO broadcasts Hemingway & Gellhorn, starring Nicole Kidman and Clive Owen. Hemingway & Gellhorn is a love story exploring the tempestuous relationship between writers Ernest Hemingway and Martha Gellhorn, which was the inspiration for Hemingway’s classic novel, For Whom the Bell Tolls. Though the story takes place in nine different countries, the film was shot over 40 days entirely on location in San Francisco and the Bay Area, which stood in for Spain, Finland, Cuba, New York, Shanghai, Key West and Idaho. Key scenes were filmed at the Swedenborgian Church at Washington and Lyon Streets, only a few blocks from Kaufman’s home. During the filming, Kaufman walked home to Vallejo Street for lunch, then back to work at the church. Graham Leggat — the irrepressible Scottish impresario who led the San Francisco Film Society on to greater glory during the past six years — died tonight at his home after an 18-month battle with cancer. Under Leggat, the Film Society made its annual San Francisco International Film Festival — the nation’s oldest — more important than ever and established its headquarters at the Sundance Kabuki Cinemas in Japantown. The Film Society’s offices are nearby in the Presidio. In 2010 Leggat rallied community support to transform the endangered Clay Theater on Fillmore Street into its year-round home. When that effort lagged, he struck a deal with the New People complex on Post Street to stage a year-round film festival in its state-of-the-art cinema. The Film Society’s programming at New People cinema begins September 1. The film crew at the snowy Swedenborgian Church, with Nicole Kidman in the doorway. Hollywood is in the neighborhood and they’re going to church — the Swedenborgian Church at Washington and Lyon. It snowed on the little church this week — or appeared to — when Nicole Kidman was filming scenes for Hemingway & Gelhorn, a new HBO film directed by Philip Kaufman, who lives just over the hill. It’s a drama centered on the romance between Ernest Hemingway and war correspondent Martha Gellhorn, Hemingway’s inspiration for For Whom the Bell Tolls. The film also stars Clive Owens and is expected on HBO in 2012.